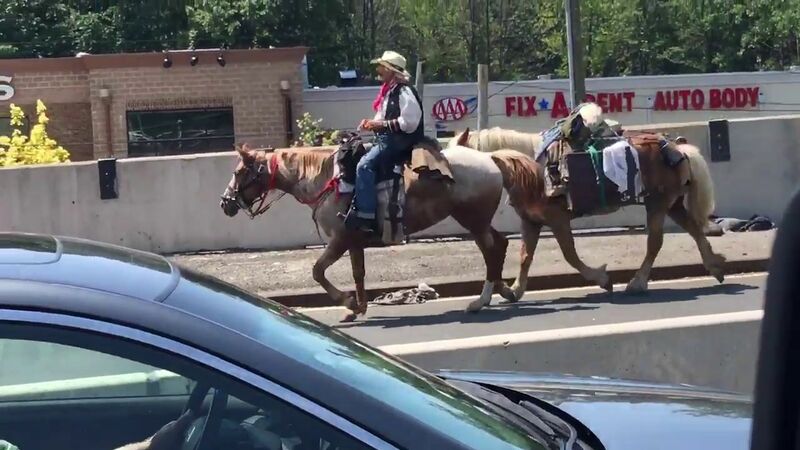 NEW YORK -- New York City police have arrested an 80-year-old man who gained national fame by riding his horse around the country saying he was a cowboy helping hungry children. Police say Tod "Doc" Mishler was taken into custody Thursday, three days after riding across the Outerbridge Crossing linking New Jersey with Staten Island. A police spokeswoman says he was given a ticket for a desk appearance. Police say the horses had open sores and were suffering from dehydration and malnutrition. Animal advocate Christine Whaley leads a group called "Stop Doc Mishler," whose members say Mishler neglects his horses. His two horses were seized Tuesday for veterinary examinations. On Monday, Mishler was issued a court summons for blocking traffic and trespassing after he rode one horse and led another across the bridge. He couldn't be reached for comment Thursday.